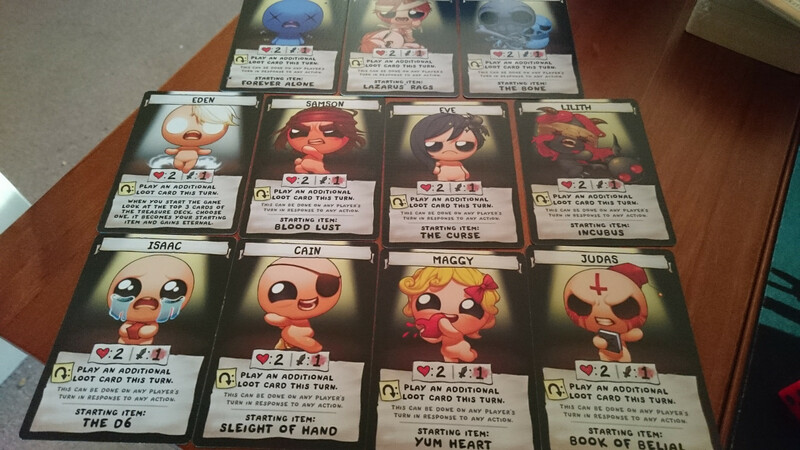 If you’ve ever played a game of Munchkin, then you’ll be familiar with the mechanics of The Binding of Isaac: Four Souls. 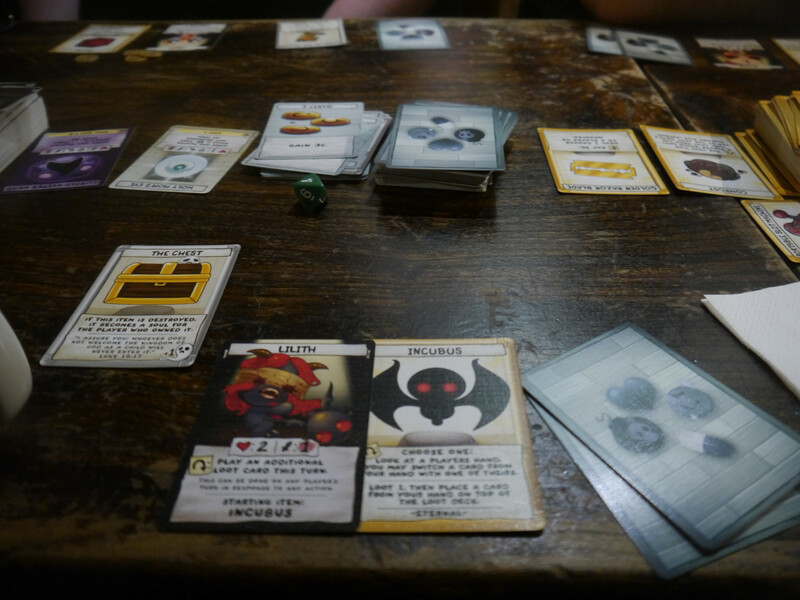 At the start of the game, players shuffle the multiple decks; one for the enemies, one for the loot, one for the treasures and the characters. Dish out a character to each of your players, which include characters familiar to the franchise such as Isaac, Cain, Lilith and Eden. Whilst all of the characters effectively have the same general vibe, Eden gets a small difference in that he gets to select his starting item between three treasures. All other characters get a specific item to start the game with, such as Isaac’s D6 or Lilith’s Incubus. Once all players are settled with a character, each player is dealt three loot items, as well as three coins. 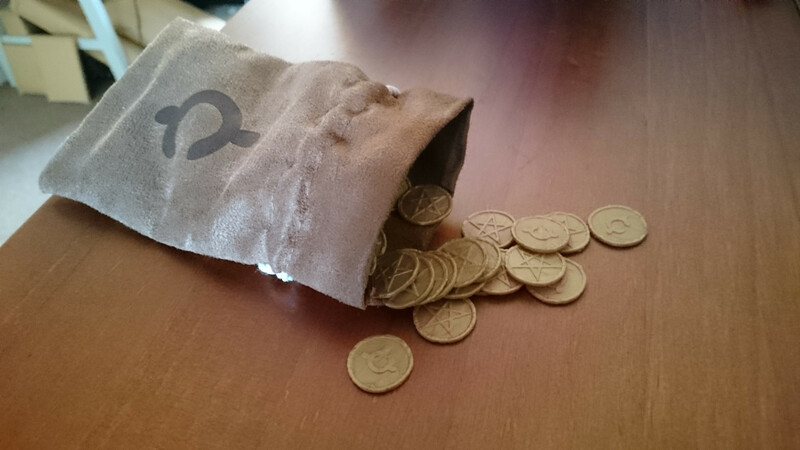 Ten coins can buy one of the treasures from the treasure shop, in which two are revealed right away, allowing players to see what they are about to purchase. 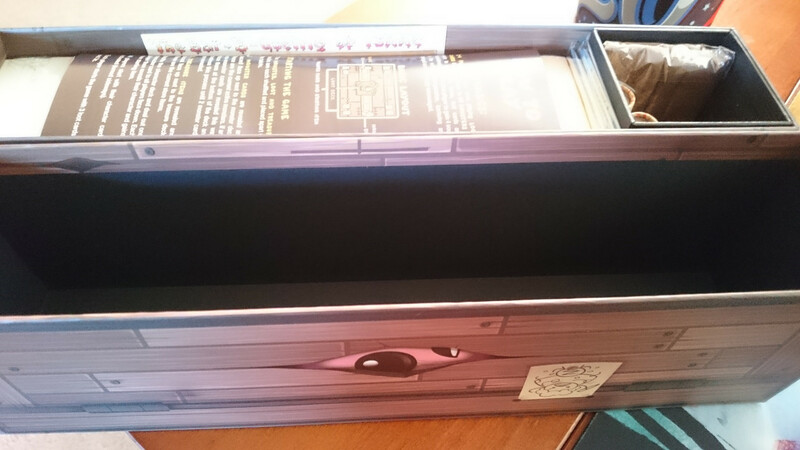 Alternatively, a player can choose to buy from the top of the treasure deck. This process is repeated with the monsters, where two are revealed to be available to fight (but keep an eye on their effects, as this affects how the game is played). Players can choose to fight either of the two revealed monsters, or choose to blind fight a monster from the top of the monster deck – And the player chooses which monster the new one replaces. Combat is really easy, using just the provided D6 for damage and the D8 for easily recognising health (which is more useful in a larger game). I don’t think you need the D8 if you’re okay at keeping track, but I like the inclusion of the die. Either way, there’s a number on the monster, which you need to get equal to or greater than. If you successfully roll, 1 damage is dealt to the monster’s heart points and once that hits zero, the player wins and gets the loot it mentions at the bottom of the card. Conversely, if the player loses the roll, the monster damages the player. Once a player commits to fighting a monster, it goes until death, which isn’t final in Four Souls. If a player dies, the player comes back to life after a whole round has happened. In a larger game, this is denoted as the player who started the game. For arguments sake, if you sat to the right of the first player and the game was going to the left, once the next player takes their go, you’re back in the game. This is an important distinction, as this is a game about co-operation… and sometimes a bit of betrayal. There are cards that outright kill players, but also cards that can help one another. Make strategic allegiances with the right people at the right time to help you win the game. 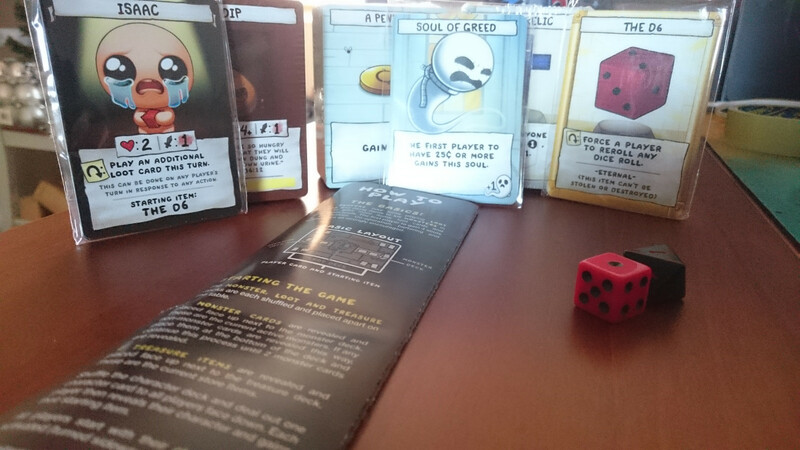 The first player to collect four “souls” (typically from monsters, or sometimes from treasure) is the winner. This is a massive up from me. 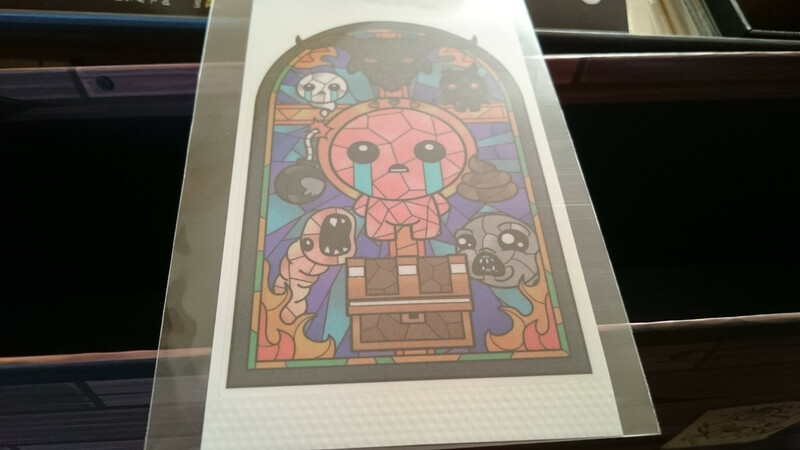 Let’s start with the artwork – If you enjoy the macabre style of The Binding of Isaac and its various expansions, then you’ll love this game. Having been designed by the creator and designer of the rogue-likes, the card game feels incredibly genuine to the source material. 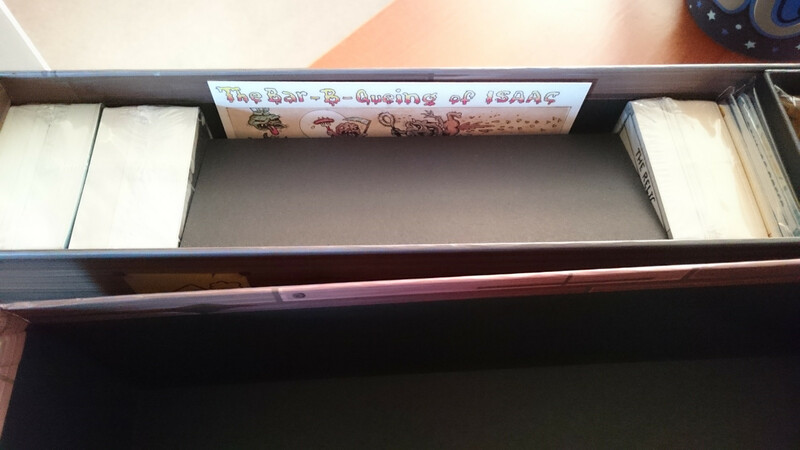 The artwork plastered over the box and over each card is beautifully crafted. Trust me, the box sits beautifully and the contents are absolutely stunning. Flimsy coins, but they do the job. Furthermore, the rattle they make in this bag is glorious! Beautiful additional artwork in my box. The instructions are printed on pretty poor quality stock… But at least it does the job. One thing I’d like to quickly chat about is the quality; there is a somewhat hit-and-miss nature of some of the contents of the box. The coins I received were plastic, which is fine, but they are a very thin plastic. Being so small, it’ll be very easy to lose one of them, or indeed have a small child or pet choke on them. With that warning out of the way with, the other element to question is the instruction booklet. 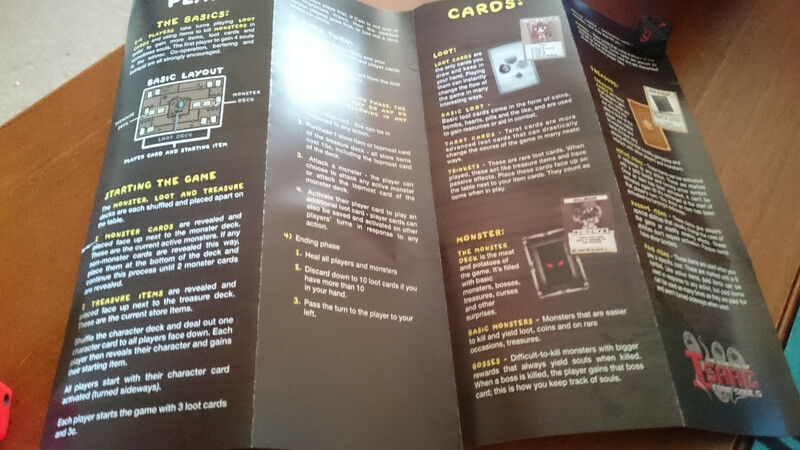 It was printed on some relatively cheap paper and it didn’t seem to address all scenarios, as we encountered a scenario or two involving the monsters that the game didn’t address (but the website did). I really enjoyed the game, but the time I got to play it was a bit stretched. The game suggested that it supports “4+” people, but in all honesty with how long it took for people to learn what to do, that’s a bit of a stretch. I’d recommend you play with no more than 4 players, because the game seriously slows down and some turns can genuinely go on for a long time, if a player is having to learn at the same time. Having said this, I don’t consider this a criticism of the game. Indeed, it’s more of a warning to say that there is a small learning curve with the game, which might not always go down well with players. There are a few points I’d say could have been addressed, such as the absence of Azazel in the base game, but he appears in a later expansion. Either way, ignoring minor niggles, the game plays very well and, for a game which is effectively a reskinned Munchkin, it stands on its own two feet well enough to differentiate itself. Having said that, the core audience may be different, but the end result is the same – A fun experience, but one you and your players may need to invest time into. If you’ve tried out Four Souls, share your thoughts with us in the comments below, or over on Facebook and Twitter. 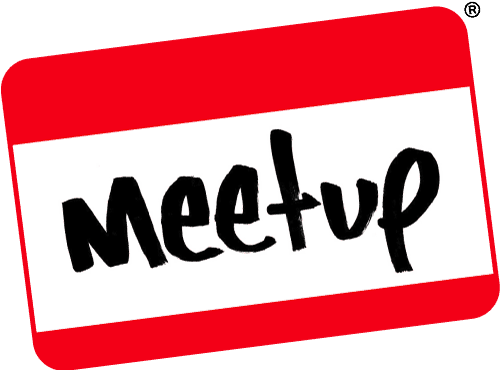 This entry was posted on January 14, 2019 by Timlah. 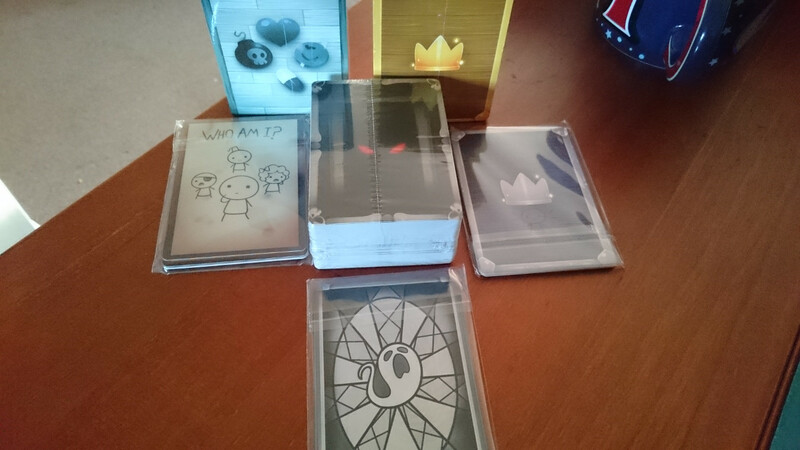 It was filed under Gaming posts, Reviews, Traditional Gaming and was tagged with Binding of Isaac Four Souls, Card Game, Edmund McMillen, Four Souls, Four Souls Card Game, Games Like Munchkin, Kickstarter, Munchkin, Review, The Binding of Isaac.